Here’s an innovative design, that’s green, recyclable, and can pack up all your tidbits to lug around, the Move-It kit. This one’s a do-it-yourself kit, and works great on trips to the supermarket, or just every time you walk out of a shop. 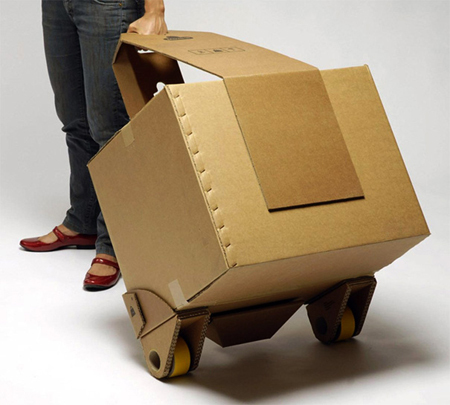 Durable and light, the Move-It kit uses self-adhesive cardboard parts, going all Transformers like, and changing from into a makeshift trolley, from what would otherwise be a useless piece of cardboard. Designer David Graham made sure putting this one together isn’t much of a task either, with the parts simply fitting in. and if you’re skeptical as to just how much a cardboard trolley can carry, quit thinking in the single digits. This one hauls a sweet 20kg. The only downside, it has a one-shopping-trip life. Meaning it needs to be recycled once you get home, body, wheels and adhesive. You just can’t dismantle it for reuse. Maybe a foldable cardboard trolley would work best!